Two of my favorite colours together! I had been meaning to try out one of these cards for quite some time. They have the side fold, but the front has been rounded and is shorter than the back. You keep it tied shut with some ribbon. Since this was my prototype, I didn't do anything too extravagant. I was just happy that it worked! 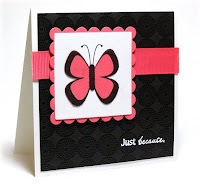 I ran the card base through the cuttlebug using the largest oval from Petite Ovals. I then ran the chocolate piece through using the same die, and then I ran the celery piece using the coordinating scalloped die. I adhered the celery piece first, then placed the chocolate piece over top, so that the interior is still all white. I found some matching ribbon, then die cut another oval and scalloped mat, stamped a branch and sentiment from Out on a Limb, and that was that! The oval is mounted up on strategically placed pop dots, so that the ribbon can easily be pulled under and through. 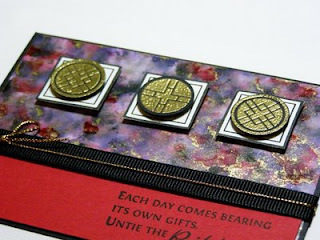 I was so busy yesterday, stamping up a storm, that I didn't even realize until today that I had nothing to show for it! (At least not yet...) So today, I decreed, was a stamping for me day. It's not like I didn't enjoy myself yesterday, but sometimes, you just need do something for the pure enjoyment. No commitments, no challenges, just back to the basics- what sucked you into stamping in the first place. You know? I finally got my hands on Wonderful Wings. It's such a gorgeous set and I really like watercolouring the butterflies with twinkling H2Os. I started with one butterfly, then sketched out a layout, which then brought to my attention that I needed to do a second butterfly. I used textured cardstock for the base and for the white panel. I think sometimes a little bit of texture is all you need to bring that visual WOW forward. You just need a bit of inspiration before starting a project. I happened to be checking out Julie's blog this morning, and took a peek inside the "miscellaneous designs". I saw this beauty from a little while back, and was hit with the inspired bug! I don't have any vellum cardstock, so I improvised. I took a piece of vellum, folded it in half, then trimmed off most of the back. I attached that to a piece of vanilla cardstock. It worked wonderfully and is quite stable. For some reason, this particular project just wasn't photographing nicely, but it is quite pretty in person! The petal prints are stamped on vanilla. I mixed banana and apricot on the flowers themselves to get a nice gradient look going. I added in a bit of speckles around the image, and finished it off with some awesome ribbon from A Muse. The vellum piece is stamped with white craft ink. I always love the look of the script in white on vellum. It's so soft and pretty, especially with those other Soft Subtles colours. One other thing I did, was add a touch of glitter to the flowers with a Spica Clear pen. It's subtle, but nice. Today is the release day for four new sets at Verve Visual! This card features one of the new sets, Asian Flair. As soon as I saw this set, I knew I needed to make a card using red, black, and gold. I did some polished stone using those colours, it's quite a pretty result! Next I stamped the squares, cut those out, then embossed the circles in gold, and popped those out with a 3/4'' circle punch. 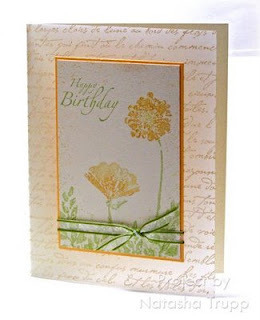 The card base is textured white paper. I added the sentiment in black on the red, then added in some black ribbon and gold cord. Here's another shot of the card in its entirety. The one reinker I used ended up going a bit purple when I mixed it with the alcohol. So afterwards, I used a bit of black stazon reinker so that black would still be present in the polished stone. I keep meaning to participate in the Hero Arts weekly challenges, I just never got around to it. Finally, I set some time aside yesterday evening and got to work. It took a lot longer than I expected, I kept changing the stamp that I wanted to use in two different ways. 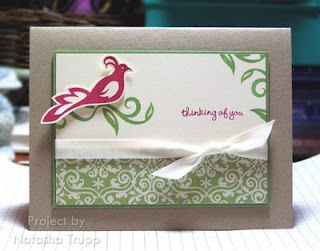 I started with a sentiment stamp, made a card, but then didn't like how the second one was coming about. So I decided to go with flowers instead! Here's my first card. I kept things relatively simple on this one. I stamped the iris first, then the other two. 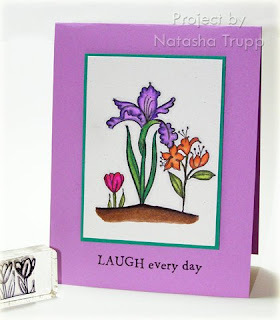 My stamp of choice for this challenge was the tulip stamp. I coloured in a little garden scene, using Copics, graphic artist markers, and even a prismacolor marker (no brand loyalty to markers here). I decided to break out two severely underused colours for my card. I did a Glorious Green mat and an Orchid Opulence card base. I was surprised by how much I liked them together. For my second card, it was easiest to stick with the floral theme. However, I wanted to change things up. I used only the petals of the tulips to make a new flower. There are 3 tulips on this stamp, so there was the possibility to create 3 different flower looks. I coloured those in with markers, and added a touch of glitter with a gold Spica marker. I also added in some gelly gems to bring more sparkle to each flower. I used the same sentiment, but this time, I put it on a tab. So, my sister needed me to make a card for one of her friends. And for the birthday, they are going to go see Wall*E, the new Disney/Pixar movie. She requested that I use a robot on the card. I happily obliged! I started out with a vague sketch in mind. 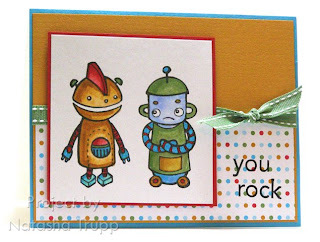 I stamped the robot on white cardstock, ran it through the cuttlebug, then stamped the sentiment. Next up came the colouring. I couldn't resist picking up a pack of Koh-i-noor Woodless Colour Pencils. They are marvelous. The coverage you get and the blending, well I'm sure you've all heard it already, but they really are that good! I coloured the robot with shades of green, and added a bit of sparkle with some Spicas. I thought about finding some good paper to match a robot theme, but I'm pretty sure I don't have any. 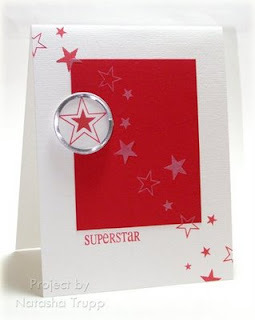 Instead, I went with embossing this fun circle background. I figured that seemed fun and whimsy in the robot kind of way. It's the 20th, you know what that means! It's time for another dirty challenge. For my card, I went with red and white for my patriotic element. I recently picked up a pack of the metal rimmed circular tags, and I really wanted to use one, so I incorporated that into the card. 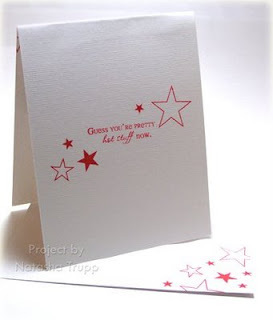 For the interior of the card and the envelope I went with a stamped "swoosh" type pattern of the stars. Well, I decided over the weekend that I wanted a Bind It All. 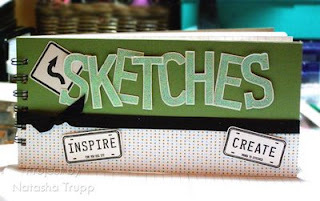 I've always been keen on making books, and this was a tool that was designed for exactly that activity. I ordered from Paper Works Co. on Sunday and received it today. The joys of ordering from within your own country: it got here FAST, and no extra fees. :D Peggy provides amazing customer service and she's constantly adding new items to her online store. 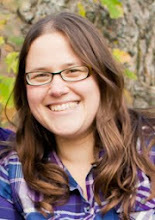 I just thought I'd give a shout out to her before showing my first BIA project. I had picked up some graph paper earlier today because I knew exactly what I wanted my first project to be- a sketches book. I have a nice notebook I currently use, however, it has so many pages and its spine is too tight. The book never stays open on my desk, and I have to really force it open while I'm writing or drawing in it. A coil bound book can easily stand on my desk. This was my very first project, and I have to say, I was surprised at how easy it all came together. 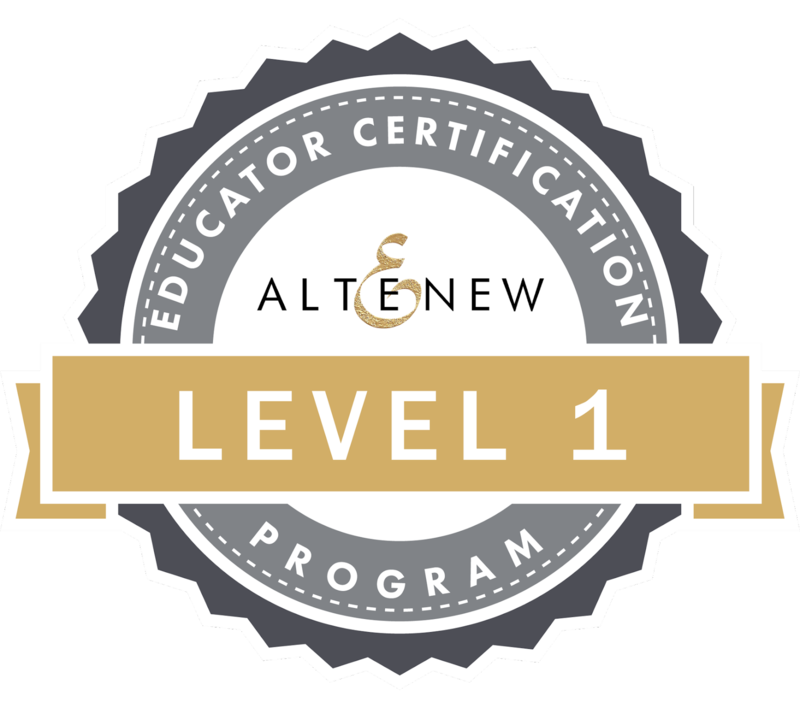 Even though I had already bought the tool, I didn't believe it could really be as easy as they advertised it to be! I figured my first project would an awkward proto-type. Not so! To the left is a close up of my letters. I used the License Plate Letters set. I stamped them on white cardstock, then I mixed together 4 different colours of embossing powder (teal, blue, lime, and orange). The result was a fun speckled look! Since I had used that font, I thought I might as well add some other traffic themed images. I stamped a sign, as well as two license plates, using the mini license plate alphabet to add in the words "Inspire" and "Create". The covers of the book were made with some chipboard I had lying around. I think it was actually the backing off of a pad of paper. It worked well, since it was thin enough to be cut with my paper cutter. Since I even looked at a sketch challenge. Now I know the purpose of the challenges are to try something new, but when I saw that today's sketch was one of my favorites, I couldn't resist! I even staged my photo like Kristina, the one who inspired this sketch. I know, I can be cheesy like that. I just picked up some fun papers yesterday- Winnie's Walls by sei. 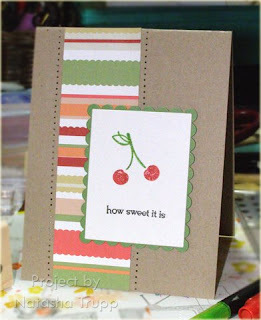 After looking at them more closely, it became apparent how well they matched Stampin' Up's wasabi, groovy guava, ruby red, and river rock, as well as PaperTrey Ink's Berry Sorbet. It's just always nice when you purchase another manufacturer's papers and it goes so well with what you already own! I've started another Kraft paper kick recently. I just love it as a card base instead of white. 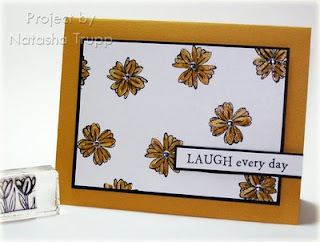 For this card, I slapped on a strip of the striped Winnie's Wall paper, added some pierced lines on either side. A slight oops in my piercing dictated the layout. Not a problem, nothing a rectangle nestability cut out couldn't hide. The cherries were stamped then covered with Spica markers for that extra glittery, sugary glow. 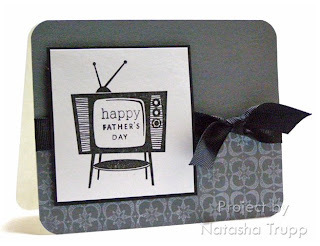 This is the card I made for my dad for father's day. He just so happened to buy himself a new tv, so it seemed appropriate to use this tv image. I like the retro feeling of that stamp, so I paired it with black, grey, and white, as well as the Linograph background and some corner rounding. 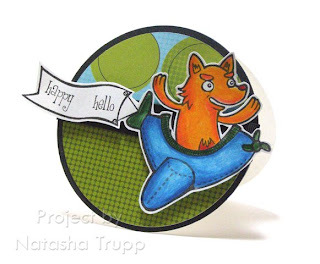 The greeting was put together using a Verve Visual stamp and a Papertrey Ink stamp. I kept meaning to make a project for this month's Verve Product Parade a bit earlier. Finally, today I did exactly that. I used the colours and the general vibe I got from the photo as my inspiration. I started with some River Rock coloured patterned paper, then set about figuring out a layout. Next I pulled out Fancy Filigree and realized that this set had more looks than I had previously thought. The way the filigrees are designed makes it a snap to stamp them than turn 45 degrees to make an even cooler design. I really like the result! I added a small gem to the interior of each filigree, matted those on a square, attached them to the strip of River Rock, then stamped a saying. Here are some more fun images from Doodle Factory. I'm not sure if you've noticed, but each one I've posted these past days has used a different medium for colouring. First it was Copics, then pencil crayons. This one is water based markers and reinkers. 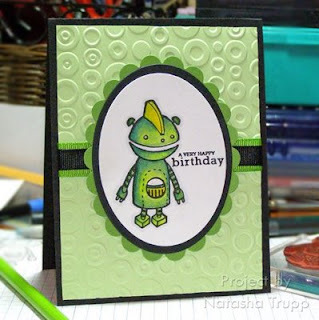 Here's another fun card using some Doodle Factory images. For this one, I started with the main image, chose my patterned paper (aka my colour palette), then built my card around it. I coloured in the image with pencil crayons. I thought this image would look fun flying over a round card. It kind of has a Globe feel to me. 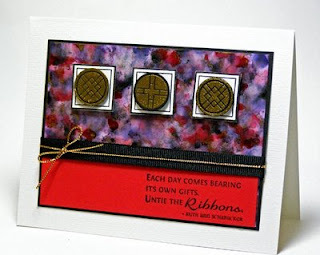 Paper: Scenic Route, Stampin' Up! Well, after reorganizing (completely!) my craft space yesterday, I finally had some time to sit down and use the newly cleaned space. It's amazing what that can do for your creativity. 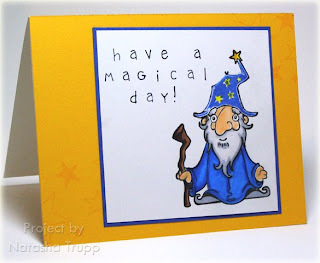 For this card, I pulled out the Doodle Factory Fairy Tale set again, and got to work. 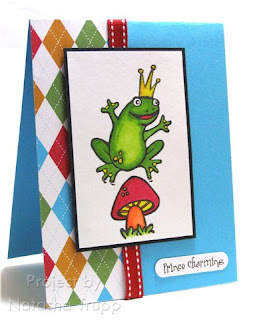 I stamped the frog, crown, and mushroom, then coloured it in with Copic markers. I was in the mood for something really vibrant, and I couldn't be happier with it's cheerfulness! Once I had the frog all done, I decided on a layout. Next, I found this argyle paper, I thought it worked well with the whole quasi-royalty theme. I added a sentiment from one of the Cat's Pajama's valentine sets, and then added some saddlestitched ribbon to bring it all together nicely. I absolutely love this Fairy Tale set by Doodle Factory, but I've barely had a chance to use it! My sister requested a birthday card for a friend of hers. Wizards popped into my mind when I thought of the friend. So I had to use Earwick the Wise for her birthday card. I was feeling a bit bummed, because I really wanted a very specific phrase to pair with the wizard. Alas, I didn't have any stamps that said such things. But wait! I totally forgot that I owned some snap stamps. They really are perfect for those out of the norm phrases. I added a few stars to the background, and that was that! I coloured this one with pencil crayons for his staff, skin, and robe, and with markers for his shoes and beard. 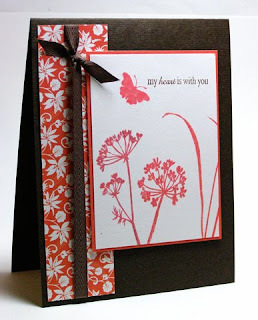 I am still LOVING this Black Orchid paper pack from SEI. I don't quite have the the right ink match for it, but Papertrey Ink's Berry Sorbet was a somewhat close match. 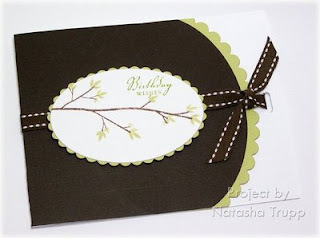 I made my card base with textured brown paper, added the twill ribbon to the patterned paper, did a bit of stamping, then pieced it all together. Here's another project I made for Verve Visual's May release. This set features the Fluttering By set. I started off by making a little box out of acetate to hold the cards. 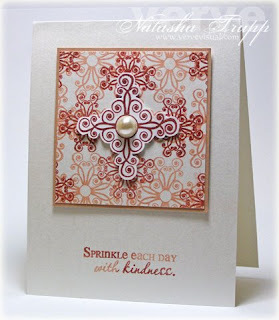 I stamped that with a polka-dotted circle stamp and white stazon. Then I added eyelets and a ribbon handle. Next I made 4 cards to go in the box-bag. I chose a single type of patterned paper, white and berry sorbet cardstock, coral ribbon, square nestabilities, and white embossing powder and got started on creating 4 different layouts. I had jotted down a few sketches to follow along, and for the most part I stuck to them. One thing that I thought was kind of fun was how I did the coloured wing part of the butterflies. 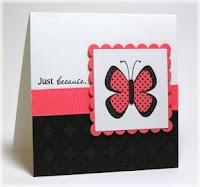 Instead of colouring it in, I stamped the butterfly on the coloured cardstock, then cut that out. 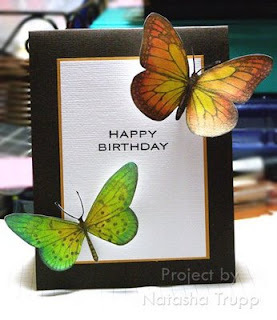 The cutting job didn't even need to be that precise, because I had also stamped the butterfly on the white square. I was kind of surprised by how much I liked the bright coral, white, and black colour combo. I've been waiting for this day for a while! I can finally share some of the fun Verve samples I've worked on! 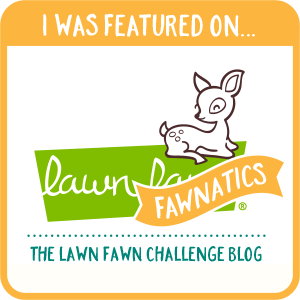 You can check out this post if you would like to read a little bit about me and see all the samples. I thought I would share my projects by set from this most recent release. Today I have a Fancy Filigree card to show. As soon as I saw this set, I knew I had to make some gorgeous background paper with the images. I stamped one of the filigree images in a few different colours, overlapping them for a cool effect. After I had that all done, I thought it'd look quite pretty to place a larger filigree overtop. I stamped one and cut it out. I looked through my stash of stuff and found these half pearls. They were the perfect size for the circle of the bigger filigree! 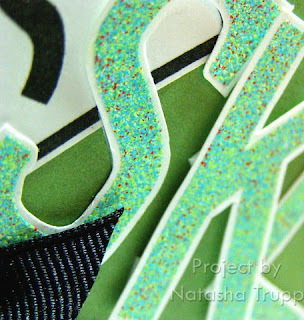 The entire card is made of shimmery white and it is quite the sparkling creation!